Designer Tommy Hilfiger speaks during the Martin Luther King, Jr. Memorial Dedication co-chaired by the Tommy Hilfiger Corporate Foundation on October 16, 2011 in Washington, DC. 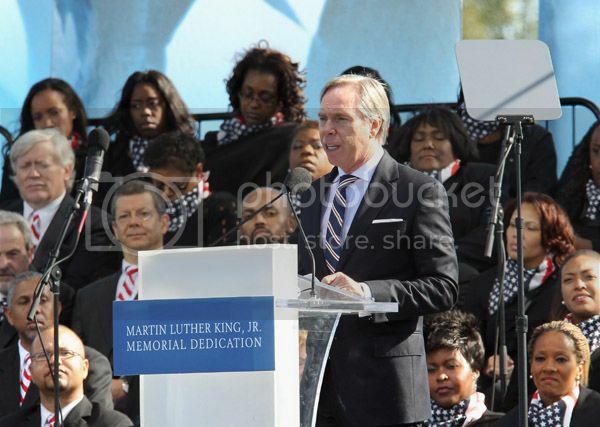 Tommy Hilfiger celebrated the dedication of the Martin Luther King, Jr. Memorial located on the National Mall on October 16, 2011 in a Dedication ceremony co-chaired by The Tommy Hilfiger Corporate Foundation and chaired by the General Motors Company. "The Memorial Dedication was a momentous occasion," said Tommy Hilfiger. "To see the Memorial built and celebrated is a remarkable milestone for all those who continue to advocate Dr. King's universal message of humanity and equality. Our Company has had the exceptional opportunity to work with the Martin Luther King, Jr. National Memorial Project Foundation for over 10 years; it is a privilege and a responsibility that we take great pride in." The Dedication events began Saturday, October 15th with the Dream Reception and Gala held at the Hilton Hotel in Washington, D.C. During the reception, Emanuel Chirico, Chairman and Chief Executive Officer of PVH Corp., accepted an award on behalf of the Company, which recognized its long term support of the Memorial. 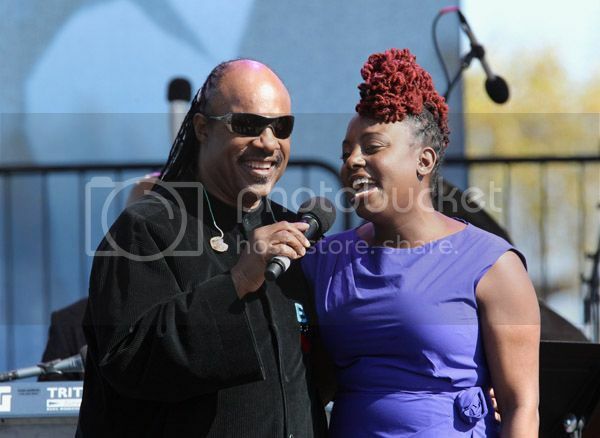 On Sunday, October 16th, the Dedication took place in West Potomac Park in front of an audience of over 50,000. The Memorial Dedication was celebrated with speeches by distinguished guests, including Tommy Hilfiger, remarks by President Obama, and a Dedication concert with performances by Aretha Franklin, Stevie Wonder, Sheryl Crow, Ledisi and James Taylor. 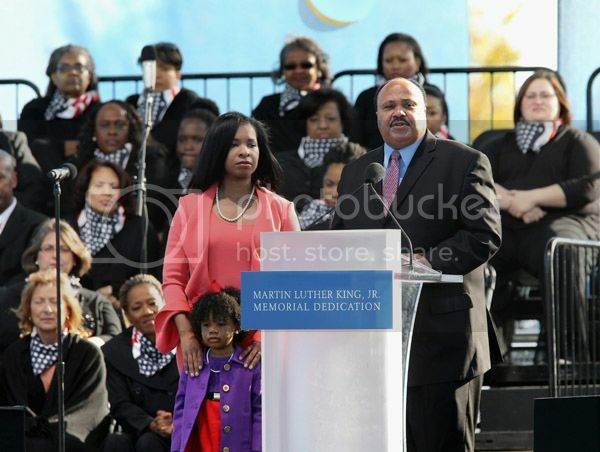 "It is inspiring to know that this Memorial will serve as a significant remembrance of Dr. King's legacy for future generations," said Guy Vickers, President of The Tommy Hilfiger Corporate Foundation and Vice Chairman of the Martin Luther King, Jr. National Memorial Project Foundation Board. "The Martin Luther King, Jr. Memorial celebrates a heroic person who dedicated his life to building a better society for all people, and represents a historic achievement for equal rights worldwide. The Tommy Hilfiger Corporate Foundation is proud to uphold this profound message." For the audience in attendance, Tommy Hilfiger donated custom baseball caps featuring artwork inspired by the Memorial logo. The Company also dressed 1,500 event volunteers in custom polos displaying the Memorial logo. After 15 years in the making, the Martin Luther King, Jr. Memorial celebrates Dr. King's legacy as one of the world's most important humanitarians. The Memorial conveys four fundamental and recurring themes throughout Dr. King's life - democracy, justice, hope, and love. A 450-foot inscription wall features more than a dozen Dr. King quotes to serve as a lasting testament and reminder of Dr. King's humanitarian vision. The Memorial includes the "Mountain of Despair" and the "Stone of Hope," a 30-foot sculpture of Dr. King. The Tommy Hilfiger Corporate Foundation has been a leading sponsor of the Martin Luther King, Jr. National Memorial Project Foundation for over 10 years through fundraising, donations, and executive involvement. Guy Vickers, President of The Tommy Hilfiger Corporate Foundation, serves as Vice Chairman of the Martin Luther King, Jr. National Memorial Project Foundation Board; the Company also has an executive on loan full-time to the Martin Luther King, Jr. National Memorial Project Foundation. For more information on the Martin Luther King, Jr. National Memorial Project Foundation, Inc. visit http://www.dedicatethedream.org/.